You can see your edits in all panes simultaneously. You can view several pages at the same time. You can view several layouts at the same time. You can use a different view mode in each pane. You can view your work at different magnifications at the same time. Choose Window → Split Window→ Horizontal or Window → Split Window → Vertical. (Windows only) Click the split bar to the right of the scroll bar (for a vertical split) or at the top of the scroll bar (for a horizontal split). 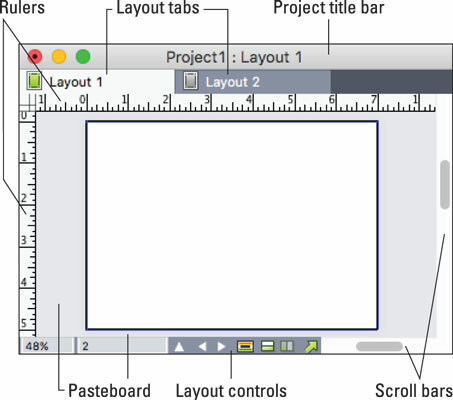 Click the split window icons in the layout controls area at the bottom left of the project window. After a window has been split, you can change the width and height of the splits by dragging the bars between the splits. You can split panes multiple times horizontally or vertically within a pane, to see several views of your project at the same time. To do that, use the same window-splitting techniques mentioned previously. To remove one pane, click the Close button (X) in the top-right corner of the pane. To remove all split panes from a window, choose Window→Split Window → Remove All.